Established in 2006, Mark 5 Films is India’s prime organizer of filmmaking and photography workshops, encouraging people of all age groups and from all walks of life to express creativity. Through our visual and performing arts programs, amateurs and enthusiasts work closely with professionals to gain hands-on experience and work in a creatively intense but fun-filled environment. Since it was founded, Mark 5 Films has expanded its base to launch Club 5, connecting creatives from all over the country in an effort to provide a platform for good quality work in the field of cinema. Recently Mark 5 Films has introduced three new programmes in the sphere of filmmaking. 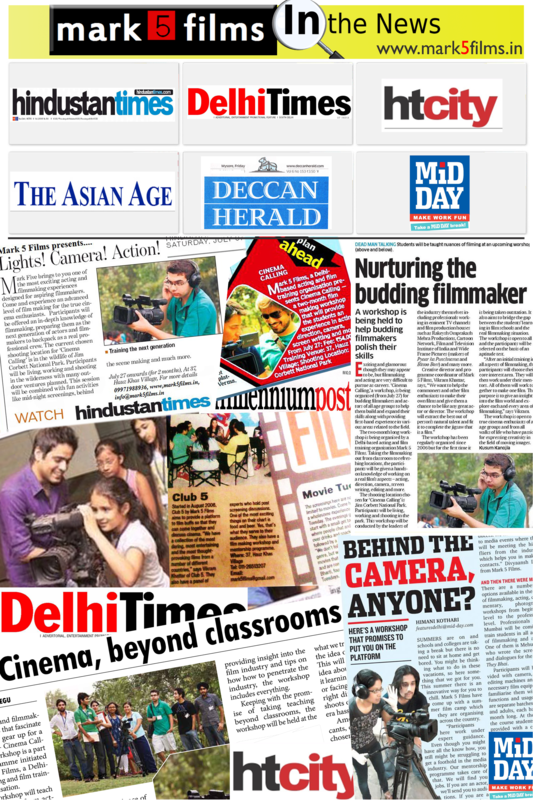 These include Documentary Filmmaking, Cinema Calling a Film Camp at various outdoor locations in India and abroad, including Rajasthan, Goa, Corbett, Simla, Greece, Bali etc. and a News Bulletin for Kids with Select Citywalk, Saket (New Delhi). course inquiry and fees structure. Kindly mail us on mark5films@gmail.com and we’ll send you the details and dates of the next batch. is it for amateur or for professional? what to know detail regarding course. Do you have courses upcoming in Pune too?